Everything Polish! : Thanks for stopping by in Pasym! Thanks for stopping by in Pasym! When travelling along the borders of Masurian Lake District, you are more than welcome to pop in to Pasym. 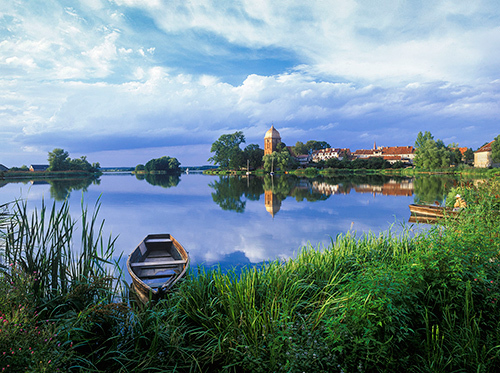 Here, in the oldest town in the region time hangs heavily and unlike big and noisy tourist resorts, Pasym upon Kalwa Lake is the Mazury where you can just sit and savour the silence. You may like to pop in to the local fish market in the morning, talk to the owner of the only store in town or simply find spare hour for a good read. A good read like "Dom nad rozlewiskiem" by Malgorzata Kalicinska with a great setting and enjoyable characters. Well written, accurate and engaging fiction bringing some sunshine and simplicity to our busy lives. Pasym - with many thanks to Mieczyslaw Wieliczko, the author of the above photograph, who kindly agreed for it to be published on this site. For more photographs by Mieczyslaw visit his official website: www.wieliczko.com.pl. Kalwa Lake - with many thanks to "Oleszka", the author of the above photographs, who kindly agreed for them to be published on this site. For more photographs and Oleszka's adventures, follow her blog: http://wildand3.blogspot.co.uk.